A beautifully presented Jar containing 11 Wild Hibiscus Flowers in Syrup with an 8 page cocktail guide on the lid. 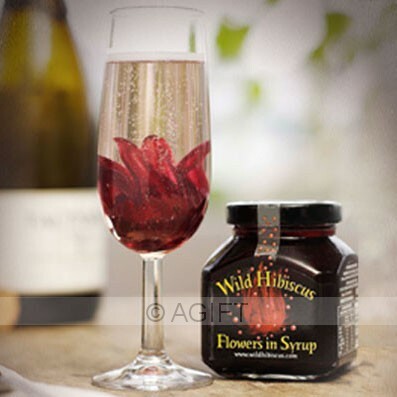 You will love the Wild Hibiscus Flowers with their vibrant crimson colour and delicious raspberry & rhubarb flavour, perfect for your next dinner party or special occasion (or just an excuse to crack open the bubbly). Serve as a classic champagne cocktail, simply place a whole edible wild Hibiscus flower in the bottom of a champagne flute, top with your favourite bubbly. All the bubbles steam of the flower and open it up. A perfect gift for that special occasion or colleagues at work and suitable for that person who has everything......They will love it! Presented in a stylish gift box with a complimentary gift card.